Like all New Years, this New Year too starts with the big bang of the four Grand Slams that are played each year. Yes I am talking of the first of the Grand Slams that has just gone underway in Melbourne, Australia on 14th January. Te matches will continue till 27th January when the men's single final will be played. The winner will get a cash prise of A$4,100,000. A galaxy of elite tennis stars including the defending champion Roger Federer, Rafael Nadal, Novak Djokovic and M Raonic. The women contesters include Serena Williams, the aging yet still dashing star from USA, besides Venus Williams, Miss Keys, Halep, Sevastova and many more. 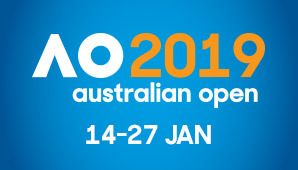 This will be the first Australian Open to feature final set tie-breaks, which will be introduced in all match formats. If the match reaches 6–6 in the final set, the first player to score 10 points and be leading by at least 2 points wins the match.